I made this card using the colors from this week's SPCC Color Challenge: Real Red, So Saffron, Bashful Blue and Old Olive. As always, I tried to find colors that were close to these official SU! Colors. Ink: Tim Holz Distressing "Antique Linen" and Memento "Lady Bug"
Love all the embossing - great use of the SPCC colours. 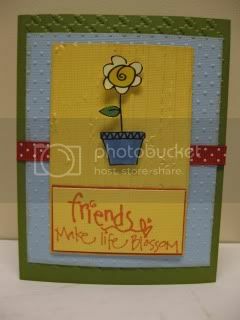 Your card is simple, sweet, and whimsical - what a delight! Thank you for using SPCC colors. Adorable little card! I love the little flower in the pot! Love the embossing! Great use of the colors! So glad you joined us this week at SPCC! !